America’s favorite sport is football. Although some can remember when baseball was the national pastime, America’s sports consciousness has migrated to the gridiron. Football is the corporate sport with bureaucratic linemen acting in coordination to open holes through which the stars can run to glory. The celebrated maestro of this display is the quarterback whose pinpoint passes avoid most of the opposing team’s defensive bulwark. When the game is played well, it is a delight for spectators and viewers alike. We are hooked on professional football. Although the quality of play varies from game to game, the quality of the business has never been better. Few enterprises could have withstood the NFL’s foolish blunders of recent years. Gregg Easterbrook, a longtime commentator on sports in various forums and the author of a series of books, details those missteps in The Game’s Not Over. 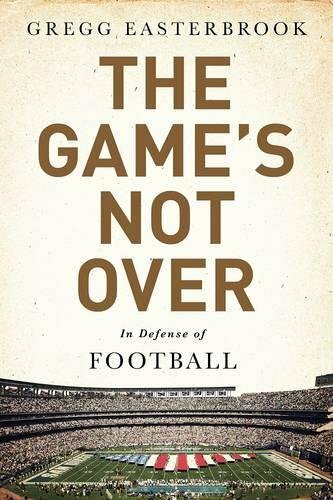 One might expect from the subtitle, In Defense of Football, that Easterbrook’s slight book would offer a paean of rebuttal to many critics of the National Football League. Although he concludes by promising us countless years of professional football to come “as we head to the stars,” you can wonder how the League will be able to withstand whatever gaffes lie ahead. Easterbrook prefaces his book with an odd attack on Tom Brady, falling into the same trap that brought scorn against Commissioner Goodell’s autocratic capriciousness in the Deflate-gate contretemps. He simply assumes Brady actively directed the doctoring of the footballs used in the 2015 American Conference final, a conclusion without any factual basis in the data. Easterbrook is correct, however, when he opines that the League “holds up a mirror to American society”—both good and bad. The insult foisted on the Patriots by the League was at the behest of the vast majority of Goodell’s employers, the other 31 owners. The egregious misjudgment by the Commissioner (and, apparently, the author) was ultimately corrected by the judicial system. The author reaches some strange conclusions in his text. We are told that professional football expanded in public importance in the 1970s because it was “war-lite,” an attractive alternative to the disastrous real-war misadventure in Vietnam. The “rising power and freedom for women,” Easterbrook suggests, has “had the unintended consequence of encouraging men to be more enthusiastic about football.” Academically, girls and women perform superior to boys and men because the latter play football in high school and college. Throughout his book, Easterbrook confuses correlation with causation. The NFL sells the television networks live programming that will not be recorded for future watching like many hit shows, thus making it virtually impossible to avoid at least looking at the highly-priced commercials. The author is harsh in his criticism of NFL avarice, but he offers few solutions. What he ignores is the political realities. Public subsidies are a travesty, but no elected official ever lost his job because he kept the local sports team from leaving town by bankrupting the public fiscal budget. Just ask residents of St. Louis how they feel about losing their Rams to the bright lights of Los Angeles. Although he offers a few valuable suggestions on further improving the safety of players in the professional game, by then the damage has been done in youth, high school, and college football. Concussions are cumulative. The damage does not cure itself over time. His historical example of boxing is quite instructive. Easterbrook is correct that boxing was the world’s second most popular sport in the 1930s, but ultimately audiences soured on watching two men punch each other into unconsciousness. Football will not suffer the same consequences, the author tells us. Perhaps that is because we do not see the veterans of football physically and mentally deteriorate before our eyes. Those fortunate enough to succeed at the professional level—one out of a thousand who play high school football—have a one-in-three chance of suffering the dementia caused by chronic traumatic encephalopathy. They choose to take the risk, and as adults they have the right to do that. We, the spectators of what is now our National Game, know that this will happen to these men. Thus, on Sunday afternoon and evening, Monday and Thursday nights, we witness the slow death of the combatants—not on the field, but in the months and years to come, out of sight, and out of mind. Can we enjoy that entertainment knowing that for every year an athlete plays pro football, he loses three years off his life expectancy? Football will always have enough gladiators willing to take the risk for large paydays, just as some are willing to engage in professional boxing. Until we see some unfortunate football player die during a game, we will just sit back and have another beer.